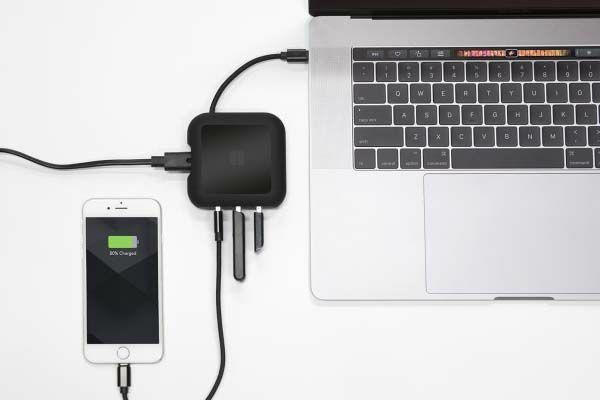 Using three extra USB ports, PowerUp USB-C MacBook charger not only Power your MacBook, but also acts as a USB-C hub to charge other mobile devices. Like the idea? Let’s continue checking. The PowerUp is a well-designed and versatile MacBook charger designed for the latest generation MacBook (2015+) and MacBook Pro (2016+). The USB-C charger measures 8.2 x 8.2 x 2.9cm (3.23 x 3.23 x 1.14 inches) and weighs 210g (7.4oz). As we can see from the images, the PowerUp sports a sleek and minimal appearance design with a solid white exterior, and it’s about the same size as a standard MacBook charger, which makes it easy to pack up and get moving. 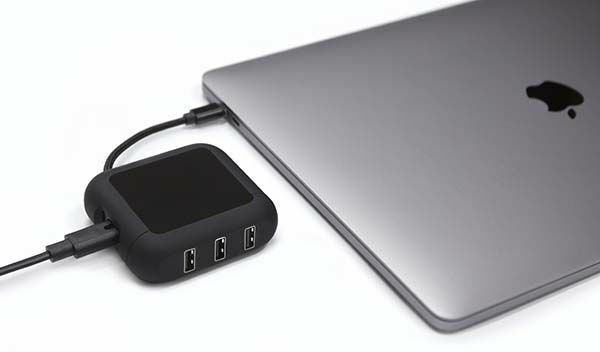 Using integrated USB-C port, the portable charger can be easily connected with your MacBook, and it features also three USB 3.0 ports in order to charge your mobile devices like iPhone, iPad and more. Furthermore, its 60W AC power is designed for charging your MacBook and up to three extra devices at the same time. Moreover, the USB-C charger also works as a USB-C hub that allows you to transmit data between your MacBook and external storage devices at a high speed. The PowerUp has been available for preorder on Indiegogo via crowdfunding campaign, and it has reached its funding goal. You can pledge $79 to preorder the USB-C MacBook charger. It will be shipped in July 2017 (estimated). BTW, don’t miss the USB travel adapter with USB-C port and more cool related gadgets by following tags.